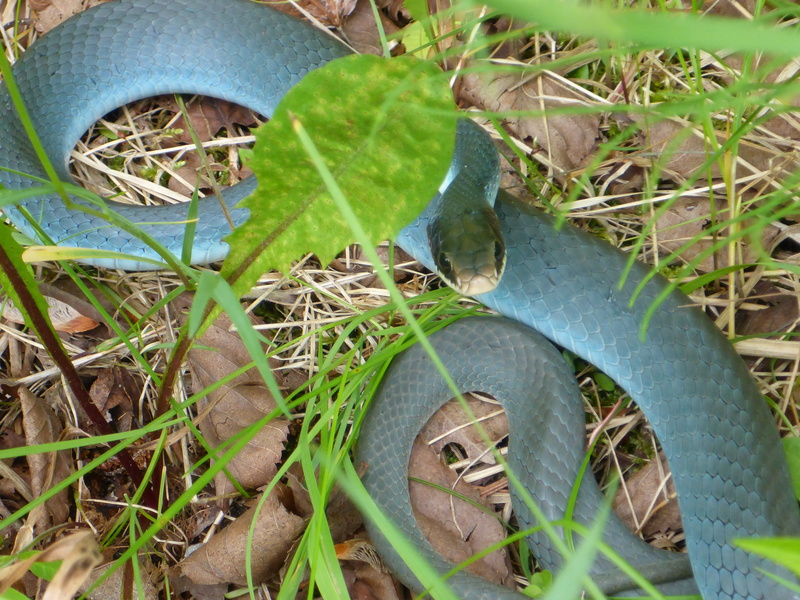 The Blue Racer is a fast, curious and non-venomous snake found in Michigan. Photo: Howard Meyerson. You don’t see these very often in the wilds of Michigan – Coluber constrictor foxi – otherwise known as the Blue Racer, but a few of us did today while hiking on the North Country National Scenic Trail. The encounter was a curious one. Three of us stared intently at it while it stared back at us, coiled in the high grass, flicking its tongue. It’s a beautiful snake, without question, non-venomous, but aggressive when cornered. We didn’t give an opportunity to prove it could retaliate with a nasty bite. I’ve often thought about them having experienced one in close proximity as a child camping with other kids at summer camp. That snake slithered into our old canvas pup-tent and scared the hell out of of us. Seeing it in the wild today brought back fond memories, of scrambling, screaming kids uncertain about whether to run or try to catch it. A Michigan DNR map showing where they have been seen in Michigan identifies only nine locations, though they were once more common. This entry was posted in Uncategorized and tagged Adventure Travel, Hiking, Nature, North Country National Scenic Trail, Snakes. Bookmark the permalink. Same thing happened to me in scouts. He went a little further though, not only did he slither into my tent he joined me in my sleeping bag. Glad you enjoyed the trail ! Charles: Thanks for the comment. I plan to have a story about it and more related to it in a couple of weeks. I’ve heard of these snakes, but never I’ve never seen one. Very pretty… in the right setting. Otherwise, I can see it scaring the bejeezus out of me! Thanks for sharing Beckie. Indeed. Check out mfs686’s experience with them. Lets ad Ludington State Park to the list of locations for the Blue Racer… I have a shot of one I tried to upload… What a beautiful creature. In the 60’s I captured a huge blue racer which soon laid eggs that eventually hatched. The neighborhood loved it when I released them too. I would often take my many snakes out to feed them in my yard which brought all the kids over to watch… Boyhood rocked! Got it, Steven. Thanks for your comment. Agreed about boyhood. Fun times.